Say Cheese…..Its National Cheesecake Day! National Cheesecake Day, which is unofficially celebrated on July 30, is only days away and if you haven’t already made plans to celebrate this creamy, delicious dessert, there is still time. Whether you love your cheesecake old school style or like to dress it up with fancy fruit before chowing it down, there is no question that we Americans love our cheesecake. Don’t miss out on this one day a year where a having a slice or two is not only justified, it is encouraged. It is safe to say that cheesecake has likely been around as long as cheese has even though we cannot confirm its existence prior to the invention of the written word. In Ancient Greece, cheesecake was fed to the first Olympians to give them the energy they needed to compete and used to make wedding cakes. However, the cheesecake of ancient times is a far cry from the complex versions of this delicious dessert that we make today. Early Greek and Roman recipes show cheese, honey, and wheat as the primary ingredients with crushed cheese and eggs sometimes included. This lead to a dish that was more suited to a savory supper than a decadent dessert. The conquest of the Roman legions is primarily responsible for the proliferation of this cheesy staple around the world. As the Romans moved across Europe, they took their version of cheesecake with them and each region then took the basic concept and morphed it into a regional variation suited to local tastes and ingredients. These regional variations are how the cheesecake of the ancient Romans became the cheesecake we know and love today. After cheesecake made its way across the Atlantic Ocean with the early settlers, it underwent another major shift that transformed it into an All-American treat. The late 1800’s introduction of cream cheese turned the traditional cakes made from pounded or crushed cheese into the creamy concoction we rave about today. Today there are two main styles of cheesecake favored across the country, New York style and Philadelphia style. New York style uses extra egg yolks to create its distinct flavor and texture and is not served with any embellishments like fruit or toppings. Philadelphia style cheesecake is lighter and creamier than New York style and is often served with fruit, chocolate, caramel, or other toppings either on the cheesecake or with it. Be aware that if you travel outside the country and order cheesecake, unless it is specifically identified as American, New York, of Philadelphia style cheesecake, you are likely to get something different than you expect. 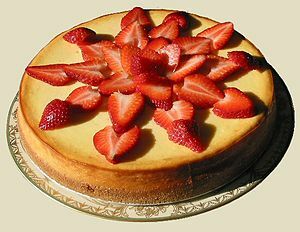 As cheesecake evolved, different countries maintained their regionally divergent recipes, a Greek cheesecake is likely to use feta cheese rather than cream cheese and one found in Italy will usually be made with Ricotta. If you are looking for a great way to celebration National Cheesecake Day in true Arizona fashion, try this recipe for Prickly Pear Cheesecake that is tailor-made from Arizona ingredients. This entry was posted in Dairy and tagged Ancient Greece, Arizona, Atlantic Ocean, Cake, Cheese, Cheesecake, Fill Your Plate, National Cheesecake Day, Philadelphia, Roman. Bookmark the permalink.